If you were able to stop by and see the Hobby Home booth at the expo - GREAT! I really appreciate seeing familiar faces and, of course, meeting new people that share my love of paper crafting. If you were hoping to get the instructions for a project you made, you've come to the right place. Of course, if you were unable to make these projects during the expo, you can also use these instructions to recreate those cards on your own. After you've checked out this page, you can browse the rest of our website, which gives you information about The Hobby Home, a gallery, projects, and previous newsletters. Enjoy your visit to our website, and we'd love for you to plan your visit to The Hobby Home! 1. The petal card die was run through the Accucut machine with the colored cardstock. Done! 2. The petal card was run through the Accucut machine to emboss two opposing petals. Done! 3. Fold the white cardstock in half to create the insert. When folded, it will be 4 ½” X 4 ½”. 4. Center the folded white insert in the inside square of the petal card. Attach with your adhesive. Two-sided tape has been provided. 5. Close the opposing unembossed petals. Wrap the first black band around the center and use adhesive to attach the ends of the band to each other. 6. Close the opposing embossed petals. Wrap the second black band around the center and use adhesive to attach the ends of the band to each other. 7. Feel free to “finish” as you like – we stamped the band, but you can do whatever you like with your petal card. 1. Run the petal die through the Accucut machine with the colored cardstock. 2. Add the tray adapter to the Accucut tray to emboss. Place the petal card onto the adapter tray with one embossing folder on two opposing petals. For our card, we used a french post and a script. Feel free to experiment with other embossing folder combinations. You could also just run it through twice using the same folder. 3. Cover the petal card and embossing card with the clear E plate. 4. Place the black D plate over the top of the card, folders, and other plate. 5. Now run it through the Accucut machine to emboss each petal. 6. Fold the white cardstock in half to make a folded insert. 7. If you would like to stamp the insert, do so before you glue it to the inside of the card. For our sample, we left it blank. 8. 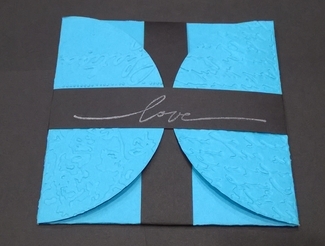 Attach the folded insert to the center of petal card. It should still be allowed to open. 9. Fold in the opposing un-embossed petals. Wrap one of the black bands around the petals and attach the ends to each other around the back side of the card. The band should still slide on and off the card. 10. Fold in the remaining embossed petals, and create the other band. Again, this band should slide on and off. 11. Decorate the band however you like. We stamped ours.